With the advent of technology, we all have to come to rely on GPS and Google Maps on our mobiles/tablets to navigate and find the best routes through the heavy traffic in the city. To ease us in using these features while driving, a mobile/tablet car mount comes handy. 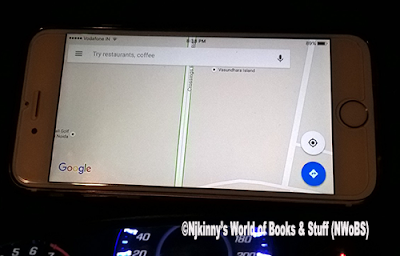 Just mount the mobile/tablet in a car mount and focus on driving without having to worry about holding the mobile/tablet every time we want to check the GPS or use Google Maps! Having tried many car mount mobile/tablet holders, I just hadn't found that perfect one which would impress me. Most are made of plastic, come with suction that loosens pretty soon and works only on smooth, plain surfaces like glass. So when I heard about Bracevor Premium 360 degree Universal Magnetic Car Mount holder for Mobile, tablet or GPS which is made of metal, is magnetic, works in 360 degree direction and can be mounted not only on plain but textured surfaces too, I was pretty intrigued. 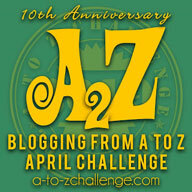 After having used it for quite sometime, today, I'll share my review of this product with you. Bracevor Premium 360 degree Universal Magnetic Car Mount holder for Mobile, tablet or GPS is a 360 degree rotating magnetic mount holder that is the perfect aid to securely hold your mobile, tablet or GPS on your car dashboard. High strength neodymium-iron-boron used in a compact design ensures that the mount takes minimal space while holding your device securely even on rough roads or bumpy rides. The mount works irrespective of whether your phone is in a back case or leather case or has a metal or a plastic back panel. LUXURY LOOKS : Premium golden brass design renders glamor to your car - No more bulky plastic cradles! 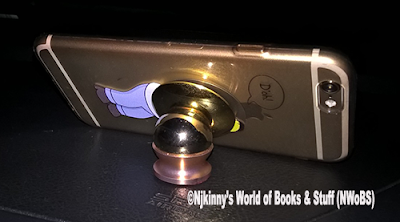 1) Classy appearance, quality and Sturdy metallic built and compact design: Bracevor car mount is made of quality brass metal with a beautiful finish in gold colour that makes it look classy and premium as well sturdy unlike the other plastic car mounts that often break easily. Its compact design ensures that it uses minimum space and still work perfectly in holding mobiles and tablets securely while braving each pothole and bump on the road! 2) Powerful neodymium-iron-boron magnets hold the mobiles and tablets with ease. Bracevor car mount uses neodymium-iron-boron magnets to hold the mobiles and tablets to the car mount and these magnets are so strong that they keep the mobiles/tablets in place despite any number of potholes and jerks that we encounter while driving. I was fearful that my mobile would fall off but it didn't. So it's a definite pass from me! 3) The car mount has the flexibility to rotate 360 degrees. Bracevor Premium 360 degree Universal Magnetic Car Mount holder can rotate 360 degrees. So just mount your mobile or tablet and enjoy turning it in any direction in all 360 degrees without having to touch the holder once its fixed in place. 4) This car mount holder is versatile and can be used not only in cars but also in our homes either on our office desk, kitchen counter or anywhere else. 5) Bracevor Premium 360 degree Universal Magnetic Car Mount holder works on numerous surfaces, not only on plain surfaces like glass but also wood, marble, plastic and even textured surfaces like the dashboards of cars! 6) The adhesive is strong and stays intact, keeping the car mount in place for long, not affected by sunlight and humidity as compared to the suction provided by majority car mount holders that weaken with sunlight and humidity and come off in a short time. 7) Can also hold heavier mobiles and tablets weighing even as much as 315 gm which is impressive as compared to the other car mounts available in the market. 8) Two metallic plates, one small and other big are provided to help support mobiles and tablets better when mounting on the Bracevor Premium 360 degree Universal Magnetic Car Mount holder. 9) The mount works irrespective of whether your phone is in a back case or leather case or has a metal or a plastic back panel. So either we stick the metal sticker directly on our mobile and mount it or stick on the plastic or leather cover and then mount the mobile with its cover on or just keep it inside the cover and then mount the mobile with its cover on, the mount works beautifully in all these cases because of the super powerful magnets it uses. Amazing, isn't it! 10) The car mount is easy to assemble, is compact in design and easily mountable. Bracevor car mount holder comes with easy to follow instructions and can be easily assembled with the help of these instructions. It is also very compact in design, much smaller as compared to the other car mounts available in the market. Bracevor Premium 360 degree Universal Magnetic Car Mount holder components with assembling instructions. 11) Bracevor Premium 360 degree Universal Magnetic Car Mount holder can hold a variety of mobiles and tablets of varying dimensions and weight. Since it uses strong magnets, it can hold mobiles and tablets of varying dimensions and weights unlike the other car mount holders that use fixed size frames to hold mobiles and thus, can only hold devices of a set dimension and weight. I tested Bracevor car mount with my Microsoft Lumia, iPhone 6s and iPad Mini and it was able to hold all these devices easily! 12) Value for money product. Priced at 1999 INR with a current discount of 50%, setting the MRP at 999 INR, Bracevor Premium 360 degree Universal Magnetic Car Mount holder is a value for money product that provides quality, beauty, ease and durability at pocket friendly rates as compared to its competitors in the market. 13) Extra adhesive and alcohol wipe pads are also provided. We get two extra adhesive pads apart from the one already present in the car mount holder that can be used to stick the car mount holder anywhere we want. 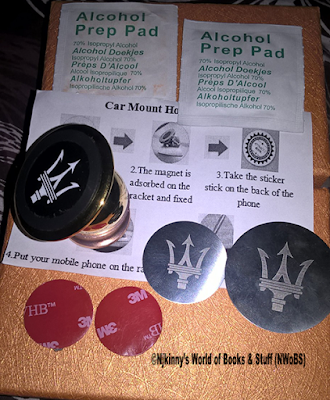 Two alcohol patches are also provided that are used to wipe the surface before sticking the car mount holder. So far, I haven't noticed any cons to this product which has managed to really wow me! All in all, Bracevor Premium 360 degree Universal Magnetic Car Mount holder for Mobile, tablet or GPS (Gold) is one of the best car mount holders available in the market and the best one that I have used so far. It is not only pocket friendly but also a quality product with a sturdy build, premium look and expertly able to work with numerous devices and so much more. 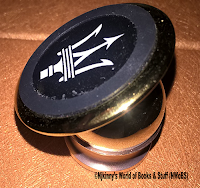 I give it 4.5 out of 5 and strongly recommend Bracevor Premium 360 degree Universal Magnetic Car Mount holder for Mobile, tablet or GPS (Gold) to everyone! I received the product from Bracevor and I am very thankful to them. The above review is my honest and unbiased opinion and in no way influenced. Step 1: Peel the adhesive from the metallic plate and attach to the back of your mobile or mobile case. IMPORTANT: Select the right spot on the back of your device/case so that the device does not graze the surface when installed. Step 2: Use alcohol prep pad and clean the surface where you want to stick the mount base. Peel the adhesive and attach it then to the surface ensuring strong adhesion. Stick the magnetic disk to the base and attach your device to the disk (held by magnet). What do you think of this product? Have you used it? Would you be trying it out?